Yes – we play special events, and we make them live up to the name! 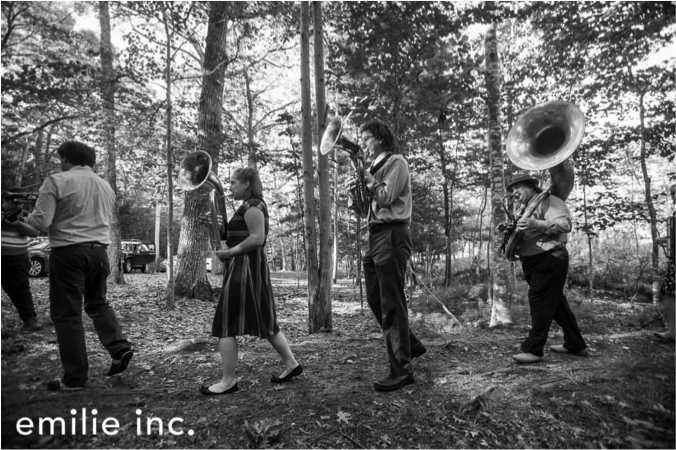 Weddings, B’nai Mitzvah, corporate events from low-key to formal, events for the mayor’s office, festivals, parades…we’ve done it all. You can read some reviews in Testimonials. WPO can take many configurations to fit your event: from a 6-piece on up to the full band. 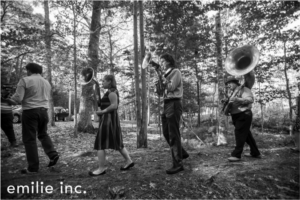 In addition to our Balkan-inspired brass dance repertoire, we also play jazz and klezmer – as anyone who’s ever danced one of our epic horas will tell you, our klezmer sets match the energy of our famous Balkan dance parties. 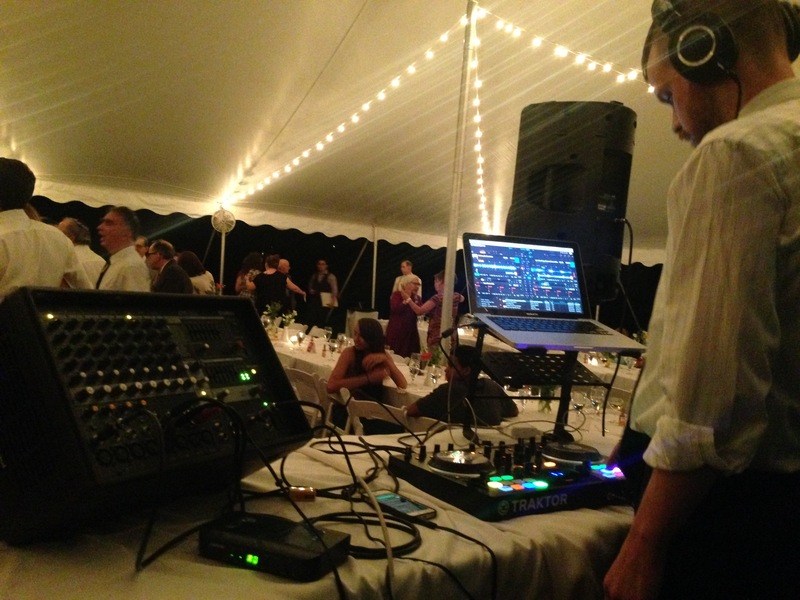 WPO owns and can provide a full, pro-quality sound system, which you can also use for toasts, speeches, A/V presentations and so forth. Interested to hire WPO for your special event? Please CONTACT US directly. 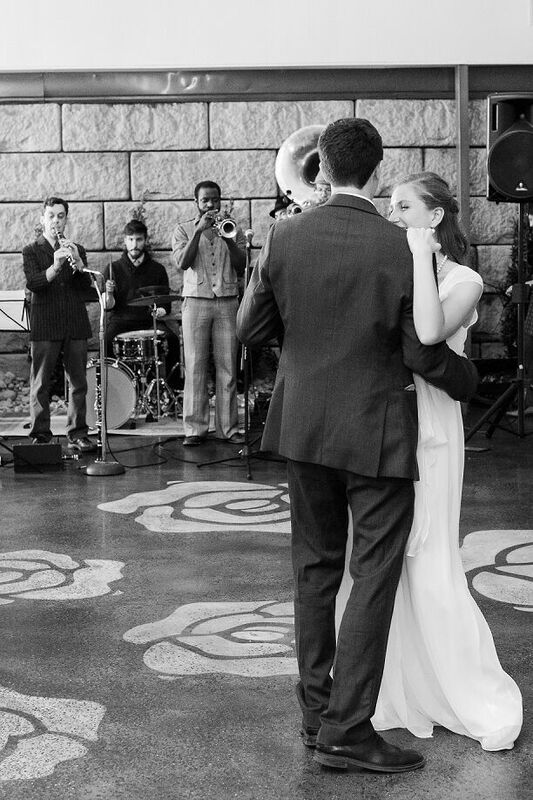 Whatever your celebration style, WPO will fit right in. 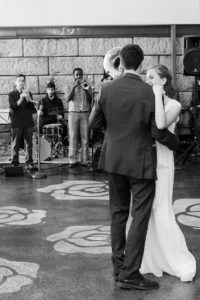 We have brought our special brand of party to every type of venue– from cookouts in shabby-chic barns and colorful circus tents, to formal affairs in hip downtown restaurants and elegant marble halls. What will we imagine together? 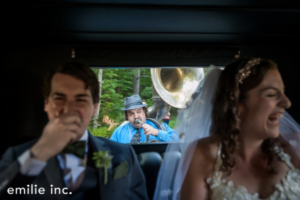 Here, the band chases the happy couple’s getaway car all the way down the street while playing them off. WPO’s festive Balkan sounds can take weddings (or any event) to bewildering, ecstatic heights only a live band can, but we understand that you might want to dance to your favorite tracks, too (that song you danced to at that bar in that city on that one amazing night…) But hiring a band and a DJ separately gets expensive. Now you don’t have to choose! In addition, our drummer Gregg is also an electronic musician, remixer and producer. Gregg remixes and releases original tunes under the GNØS moniker, and he loves DJing. For weddings and popular street events, he lets loose on classic funk, disco, R&B, EDM and hip-hop, or whatever moves your feet, while left to his own devices he spins Global Bass and an eclectic mix of house.